One Asean. One Framework. One Network. 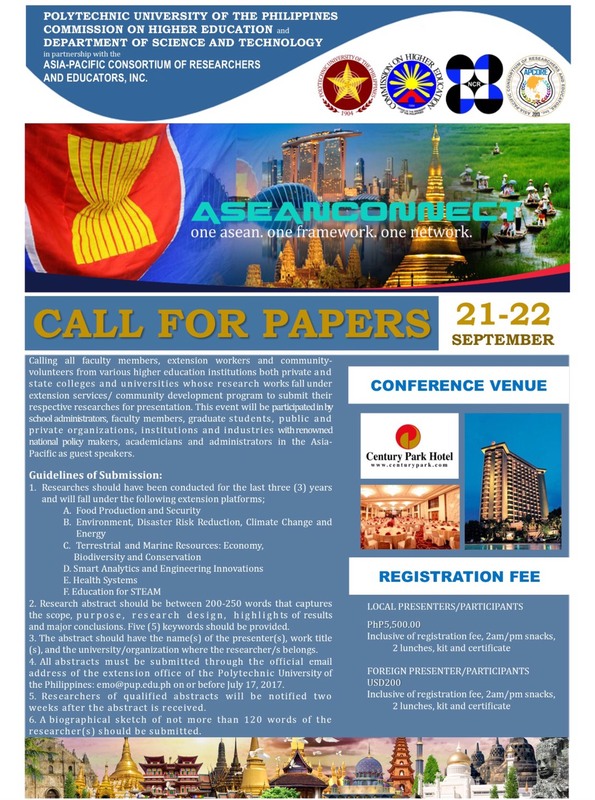 Asia-Pacific Consortium of Researchers And Educators, INC.
(1)Research abstract should be between 200-250 words that captures the scope, purpose, research design, highlights of results and major conclusions. Five keywords should be provided. (2)The abstract should have the names of the presenter, work title, and the university/organization where the researcher belongs. (3)Researchers of qualified abstracts will be notified two weeks after the abstract is received. (4)A biographical sketch of not more than 120 words of the researchers should be submitted. (5)All abstract must be submitted through the official email address of the extension office of the Polytechnic University of the Philippines: emo@pup.edu.ph on or before Aug. 04, 2017.